One great merit of Jessica Swale’s play, in addition to it being immense fun, is that you get to see Nell Gwynn not through the eyes of others but very much on her own terms. The Nell Gwynn of history, one of the first English female actors as well as the king’s favourite mistress, made an impact on those who met or saw her. Her acting career was, in fact, brief although her comedy roles were the talk of 1660s London. But there was always more to her than being able to make a grand entrance, turn heads and make people laugh. She was not just some charismatic “tart with a part” who went from street work to infamy, by way of the stage. She had steel and determination. 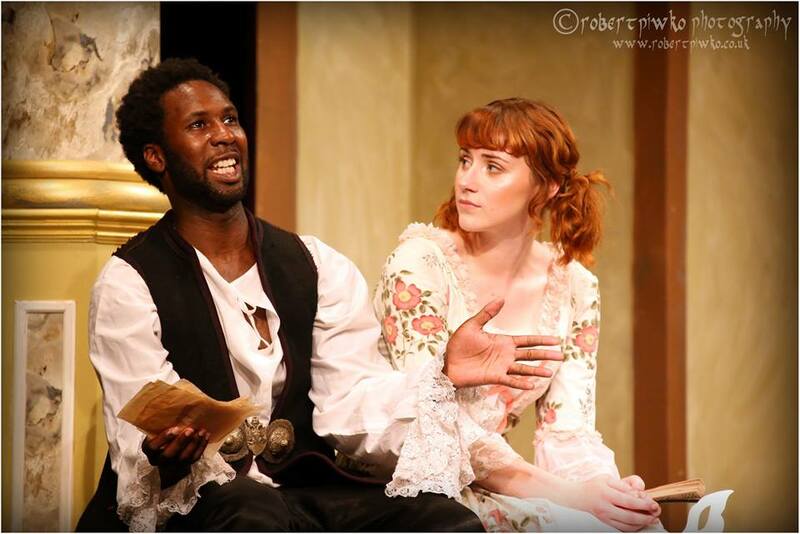 Of course, the Nell Gwynn of this twenty-first century play is not exactly the same Nell Gwynn of Restoration London – and there has been licence with the historical details. But this play makes you understand how it was possible that this cheery orange-seller could and did end up as the king’s long-term lover. Bethan Boxall was outstanding as Nell Gwynn. She was not played as a ‘Character’ with a capital-C but as an authentic struggling person: smiley and dominant to be sure, but also plausible. You could believe that she achieved what she did without it really changing her. Boxall’s Nell Gwynn made everything out of all the well-written entrances in the story: as a heckler in the audience, to her impressing the actor Charles Hart and encountering the stage company, and to her meeting the king. When she flirted with James Mercer’s Charles II, you could readily believe he was being slowly pulled round her little finger. But what made the performance complete was how Boxall also showed how Nell Gwynn dealt over time with the egos of the acting company and of the king, and stayed sane and cheerful the whole time. When the king mentions a family tragedy, you could see her sincere empathy. Her confrontations with a cast-aside mistress of the king and with her own drunken mother had immense power, and were perhaps the best scenes of the play. When she is asked at one point what rhymes with Godiva, she replies “Survivor”. And indeed she was. Boxall’s performance was one of many first-rate performances. Jan Greenhough was superb as the drunken defiant but needy mother. Heather Wain’s flair for comic acting and timing made for a hilarious turn as the stagehand and reluctant actor Nancy. The various WAGS of the king were finely portrayed by Sophie Gissing, Heather Phelps and Cheryl de Bie. And as Nell Gwynn’s sister Niamh Clark skilfully provided foil to her sister’s flights of fancies. As for the male roles, Mercer’s happy cynical king was convincing in both his hedonism and his wisdom, and his exchanges with Nell Gwynn crackled. Charles Hart could not have been played better by Robert Chambers, and Matthew Stewart really should do a one-woman show as the female-playing and engagingly camp Edward Kynaston. Richard Gissing played the actor manager Thomas Killigrew with all the world-weariness of a Peter Quince dealing with a company of Bottoms. Seamore Nelson as the anguished fussy playwright John Dryden was also a particular highlight. There were great details in almost every scene, from an adorable spaniel to a remarkably large hat. The use made of the auditorium for some of the scenes was also inspired, with the show not being limited to the stage. The costumes were gorgeous thanks to Kay O’Dea. The singing and dancing were done as perfectly as the acting. Overall, this was yet another great production overseen by Jessica-Ann Jenner. The only faults one can mention were those of the play, and not of the production. The “court” scenes will never be as compelling as the “theatre” scenes, and the play’s rollicking first scenes will always tend to overshadow the latter ones. But such quibbles did not matter, for the BLT production was highly enjoyable well as genuinely moving. The play was an utter delight to watch and to think about long afterwards. It made an impact and it still lingers. Nell Gwynn would have approved.